An adjustable steam emission knob, a swivel jet frother, and two thermostats for water and steam are just a few of the features. The unit comes with a built in tamper for leveling grounds. Three switches control power to the unit, espresso and water delivery, and steam, making the process very uncomplicated. The thirty five ounce water tank is removable for easy cleaning or filling. The machine goes the extra mile, preheating the cups and filter holder with hot water. The drip tray can be removed for cleaning and the DeLonghi comes with a one year warranty . 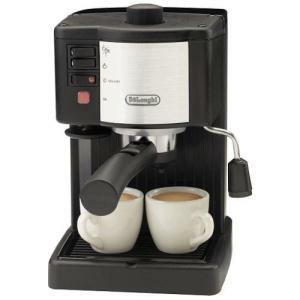 Pair this machine with a good burr grinder and milk thermometer and you will be set to prepare your own espresso. It also works with prefilled pods. People often start with a steam version and graduate to a pump as they give better results. This model is a perfect home machine- affordable while still standing up to long term daily use. People find the frothing wand works very well and the machine rarely if ever clogs. While most users find it takes a few tries to get used to the machine and make small adjustments in their process, they find it is possible to make a perfect capuccino or espresso at home. Here's another DeLonghi model you might like.